Google has announced Google Fiber, to be installed first in Kansas City. 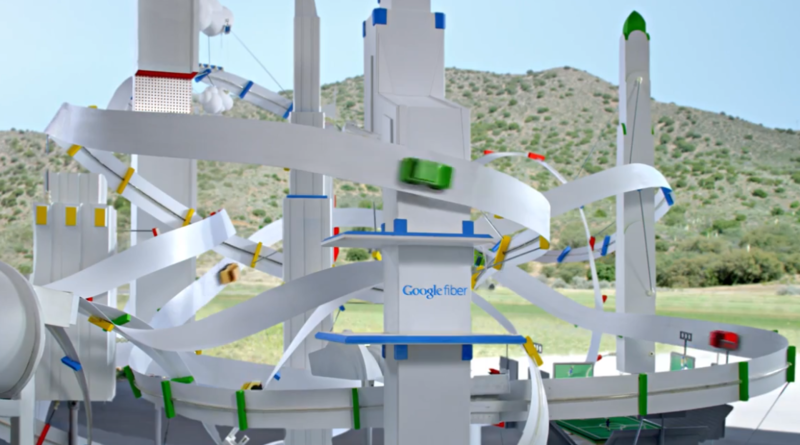 Google Fiber is 100 times faster than today’s average broadband. Imagine: instantaneous sharing; truly global education; medical appointments with 3D imaging; even new industries that we haven’t even dreamed of, powered by a gig. Google has divided Kansas City into small communities called “fiberhoods.” To get service, each fiberhood needs a critical mass of their residents to pre-register. The fiberhoods with the highest pre-registration percentage will get Google Fiber first. Households in Kansas City can pre-register for the next six weeks, and they can rally their neighbors to pre-register, too. Once the pre-registration period is over, residents of the qualified fiberhoods will be able to choose between three different packages (including TV). While high speed technology exists, the average Internet speed in the U.S. is still only 5.8 megabits per second (Mbps) — slightly faster than the maximum speed available 16 years ago when residential broadband was first introduced. “Access speeds have simply not kept pace with the phenomenal increases in computing power and storage capacity that’s spurred innovation over the last decade, and that’s a challenge we’re excited to work on,” says the Official Google Blog.